Do you plan to Power up your Media Experiences in 2019? Download the Digital Signage Brochure to make the best out of the opportunity to engage your customers once they enter your service area. Wavetec has designed dynamic displays to assist companies in enhancing communication and delivering targeted promotional content effectively. How can you create interactive media experiences with Donatello Media Player? How can you manage a network of digital displays from a centralized location? How can you improve your brand engagement using digital signage? 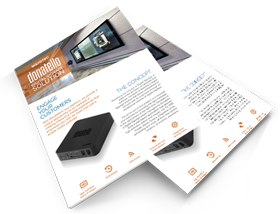 Download the brochure to find out how our digital signage solutions can empower you!